With all that’s going on in the world today, it’s hard to find true peace. There are conflicts, wars and rumors of wars all over the globe. People are starving, some are without clean water to drink, and many are dying in war torn communities. Tuning into the news can be a traumatic, depressing experience, which is why I no longer watch the news on television. The Bible speaks about two types of peace; peace with God and peace of God. When you were still a sinner and hadn’t yet given your life to Christ, sin separated you from God. 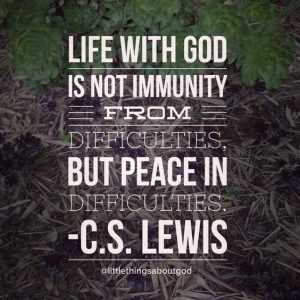 Jesus’ sacrifice turned away the wrath of God, which gives you peace with God (Romans 5:1). You are now reconciled with God through Jesus. You can now have a relationship with God without any barriers. This should bring a sense of peace that cannot be broken, no matter what is happening around you. The other type of peace, peace of God (Philippians 4:7), surpasses all understanding, meaning your finite mind can’t comprehend it. But all you need to know is there is no need to worry about anything because God knows the plan that he has for your life (Jeremiah 29:11). All we need to do is pray in everything that we do, ask humbly and with thanksgiving, simply put, make your request known to God and he will do the rest. This is true peace of mind. God is a God of peace. Wars and conflicts are man-made, because of man’s (humans) sin. But no matter what, God is always with us, saints and sinners alike. True peace comes from knowing God presence is always present.